Elvey has been central in the establishment of numerous control rooms for both alarm monitoring companies and offsite video monitoring control rooms. Ingo Mutinelli, who heads up the company’s business development unit, says that the deployment of various leading-brand professional products in the control room space have allowed installers and service providers to monetise the products and services they provide and to increase their overall offerings to the industry. This is turn provides end users with a wide variety of options tailored specifically for their requirements. “Elvey believes that it’s not enough that a series of surveillance products have been deployed. It’s important that one takes it a step further by developing solutions that can add to a system in order to achieve maximised security and return on investment,” says Mutinelli. DeepAlert’s real-time alerting solution leverages deep learning artificial intelligence (AI) technology to perform video analytics on a continuous basis. The system analyses what is deemed unusual in a scene and delivers relevant alerting that is associated with predefined preferences. The system constantly learns, increases in accuracy and builds better models based on the inputs it receives. “The ability to sift through ‘noise’ and offer alerts tailored to an installation’s specific requirements make this a great choice for offsite monitoring,” says Mutinelli. User-defined exclusion zones can be added to ensure complete accuracy and minimised false alarms. The cloud-based infrastructure provides a simple drop-in solution that works with almost any modern camera system. Remotely managing fleets allows fleet owners to concentrate on their core business while the Autowatch technology provides targeted control of their fleet. Leveraging years of R&D into telematics, the range allows companies to increase their profitability and decrease time and resource wastage. The Autowatch 852 Ruby is a video streaming system designed for safety and driving analysis using video technology. It allows for up to four wired cameras to record continuously while the vehicle ignition is on and for a further predefined period after the vehicle engine is switched off. It has a mobile and Web interface for on-hand video view and alert monitoring, ensuring that users are able to monitor their vehicles in real time from any location where connectivity is available. The system has a solid state onboard storage capability of over 200 hours and allows two-way communication with the driver. The discreet listen-in feature will alert to the presence of unauthorised passengers, thereby ensuring that the vehicle is used for business purposes only. Further features include driver behaviour alerts such as harsh braking and excessive speeding, and the GPS capability allows accurate tracking of the vehicle’s location. Another product from Autowatch that enhances fleet security and safety is the Breathalok alcohol ignition breathalyser that can be easily incorporated into the Autowatch 852 Ruby and which prevents drivers from driving while under the influence. The system’s GSM communicator allows real-time reporting for instant action by the control room. The unit uses electronics counter circumvention measures (EECM) that allow the system to distinguish between mechanically simulated (false) and human (real) breath samples, for complete accuracy. 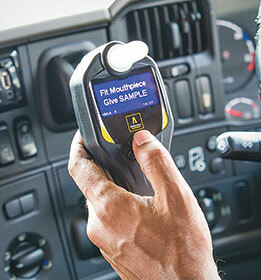 When there is a driver change in the vehicle, the system prompts the new driver to provide a sample. The Permaconn PM 54 4G LTE alarm communicator allows smart communication using high-speed Internet routers and Wi-Fi hotspots. Enabled with secure, high-speed 4G connectivity, this dual-sim communicator allows one to connect any Internet-ready device and view high-definition CCTV in real time. “This is an industry-first, with the alarm, router and hotspot features working together simultaneously. The system installation is completely plug-and-play, with configuration enabled remotely over 4G or IP using Atlas,” says Mutinelli. Mutinelli says that because each installation and application is unique, it is advised that customers contact the Elvey team to design a control room solution that considers all business-relevant factors.